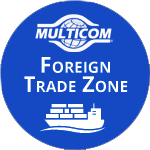 Orlando, FL – March 5, 2019 – The Foreign-Trade Zones Board, under the Foreign-Trade Zones Act of 1934, has granted Multicom, Inc., the authority to establish a Foreign-Trade Zone in one of its three warehouses in Longwood, Florida. Multicom, a winner of the President’s ‘E’ Award for outstanding contributions to the export expansion of the U.S.A., and a member of the U.S. District Export Council, has been a leader in foreign exporting in Central Florida for over 20 years. Established in 1982 and headquartered in Orlando, FL, Multicom, a manufacturer and stocking distributor, maintains sales offices, rep agencies and sub-distributors throughout North and Latin America. Multicom stocks over 19,000 products from more than 380 of the world’s major manufacturers which are used to acquire, process, and distribute audio, voice, video, data, energy, and traffic control signals over fiber optic, copper, coax cable, and wireless.